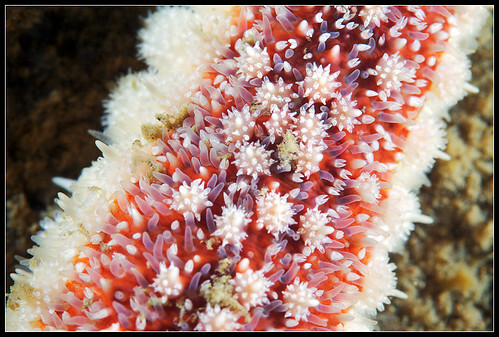 The Echinoblog: Wow! Urasterias Vs. Amphipods! BONUS Echinoblog! 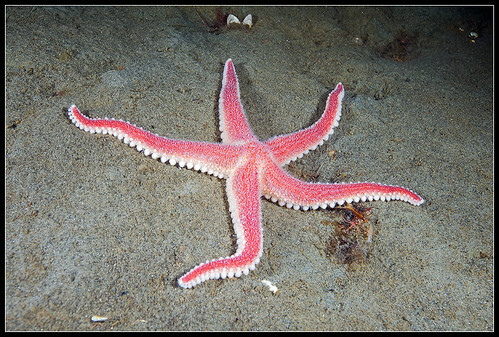 Last night I found this..
A video that shows the Arctic asteriid starfish Urasterias linckii just PLOWING into a field of creepy caprellid amphipods! This looks like it might be feeding or possibly the opposite-defending itself?. Are the pedicellariae "batteries" on the side being used? Do these species typically interact? Many mysteries! As a caveat-this video could have been staged, obivously some time lapse was used, not sure. but it IS pretty cool and is I think the first time I have EVER seen Urasterias alive in a video! So, enjoy! And a close up of the MANY pedicellariae. They are quite abundant and pretty frakking HUGE! I've spoken recently of how the diving community and the many, many legions of marine photographers have captured SO much on the Internet-often without realizing what they've done! And here is another GREAT example! This is awesome. Has anybody else observed similar phenomenon with genus Pisaster? Pisaster ochraceus lives in a very different setting (the turbulent intertidal) than Urasterias and feeds mostly on mollusks-especially mussels.